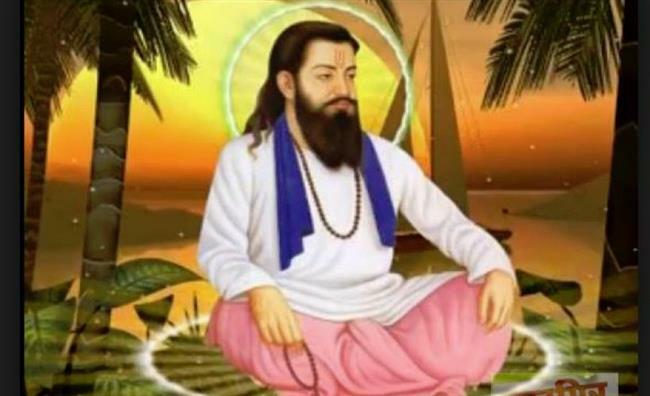 Bhagat Ravidas Ji (1377-1527) was born to Raghu Ji and Ghurbinia Ji at Seer Goverdhanpur in Varanasi (also known as Banaras), Uttar Pardesh. In his sacred memory, at his birth place Shri Guru Ravidass Janam Asthan Mandir has been established. The picture of this Mandir is being given at the end of this write-up. Throughout the year his followers visit this Mandir to pay respect to him and especially on his birthday lacs of his followers visit this sacred place to pay their obeisance. This year i.e. in 2019 his birthday falls on February 19 and will be celebrated all over the world. He is respected by the Sikhs because he is one of the fifteen bhagats (holy men) whose compositions have been included in Sri Guru Granth Sahib, the Holy Book of the Sikhs. Vary little information is available about his biography. But he has given some facts about his life in his hymns. In his hymns given below he has proclaimed that he was born near Varanasi, he belonged to a low-caste Chamar (This word is used for scheduled caste or any of this caste's members usually engaged in leather work or weaving trade, shoemaker, cobbler) and that he followed the family profession of tanning hides and making shoes. In his compositions he has called himself a chamar several times and also that his family is doing all those chores which the chamars perform. I carry the carcasses out of the city. Says Ravi Daas, the cobbler. I have come to your Sanctuary, O Luminous Lord, my King; so says Ravi Daas, the shoemaker. The colour of my Lord’s love, however, is permanent, like the dye of the madder plant. So says Ravi Daas, the tanner. I am dedicated to your loving devotional worship, says Ravi Daas the tanner. He has proclaimed that all the leather-workers in those families still go around Benares removing the dead cattle. This means that he being a chamar was carrying the carcasses of dead animals and that other members of his family which was low caste were still doing this work. It may be added that the main occupation of chamars is carrying the dead animals to the place where their skeletons are collected, skull of dead animals is peeled and out of the leather shoes are made. He was a disciple of Ramanand Ji and a contemporary of Bhagat Kabir Ji. For sometime, Bhagat Ravidas Ji followed the family profession of tanning hides and making shoes. Later on he started admiring the company of sadhus (hermits). He left his house and constructed a thatched hut and started entertaining ascetics in his hut. In the early stages he worshipped images and idols. But later on he immersed all of his idols in the river Ganges and started worshipping the God Almighty. He travelled widely to propagate his message that God is omnipresent and omnipotent and we should concentrate on His Name rather than worshipping idols. He disbelieved in the ritualism of (i) going to pilgrimages and (ii) bathing in the 68 tiraths (sacred shrines of pilgrimage). He travelled through Rajasthan, Gujarat, Andhra Pradesh, Maharashtra, Gurgaon, Prayag, Mathura, Vrindavan, Haridvar and Multan (now in Pakistan). In the sacred memory of his visits monuments have been raised at several of these places. He preached that God is unicity and omnipresent and also omnipotent i.e. he is unique, is present everywhere and is all powerful. He is respected by the Sikhs because he is one of the fifteen bhagats (holy men) whose compositions have been included in Sri Guru Granth Sahib, the Holy Book of the Sikhs. Sri Guru Arjan Dev Ji, besides including the hymns of his four predecessor Gurus and his own hymns included compositions of (i) 15 saints belonging to different religions and castes - Mohammadan, Brahman, Jat, washerman, calico-printer, chamar, weaver, Rajput and barber (ii) 11 bhatts and (iii) four other holy men- Bhai Mardana Ji, Rai Balvand Ji (doom rababi), Bhai Satta Ji (doom rababi) and Baba Sunder Ji. The Holy Book of the Sikh is the only Holy Book, in which the contributions of holy men of different religions and castes have been included and the compositions of all these holy men have been given equal status. By including the hymns of Bhagat Ravidas Ji in Sri Guru Granth Sahib all his followers instead of being termed as 'low caste' became children of One Father. The basic tenets of Sikh religion include that all the creatures have been born out of One Light i.e. God Almighty. So, no one is higher or lower than any other person. Sri Guru Nanak Dev Ji envisioned a society which discards class and caste prejudices and places all individuals on an equal footing irrespective of their socio-economic status and caste. He preached that the distinctions made on the basis of religion and caste do not have any relevance in the parlok (the next world) because all individuals have been created out of One Light. In the parlok (the next world) what will matter is truthfulness. Following the footsteps of Sri Guru Nanak Dev Ji the succeeding Sikh Gurus in their compositions also discarded caste prejudices. It may be added that in Sri Guru Granth Sahib, Sri Guru Arjan Dev Ji, the fifth prophet-teacher of the Sikhs while compiling Sri Guru Granth Sahib, the Holy Book of Sikhs, in addition to the compositions of his four predecessor Gurus and his own hymns also included the compositions of those bhagats who had expressed views in consonance with the tenets of Sikh religion. Hence Bhagat Ravidas Ji’s 40 shabads have been included in this Holy Book which belong to ragas (musical measures) - Siri, Gauri, Asa, Gujari, Sorathi, Dhanasari, Jaitsari, Suhi, Bilaval, Gaund, Ramkali, Maru, Kedara, Bhairau, Basant and Malhar. Bhagat Ravidas Ji preched that God is unicity and omnipresent and also omnipotent i.e. he is unique, is present everywhere and is all powerful. Because of his low caste he was given many troubles by the Brahmans. These caste-based rifts reached the Mohammadan ruler. Since idol worship is forbidden in Islam, the Mohammadan ruler cleverly thought of a plan wherein he could degrade both the groups. He decided to put a few idols on a silver chowki and put them on the other side of the river. Since Brahmans considered idol worship to be their right only and forbade low caste persons to do idol worship, the ruler gave them the first choice to get the idols floated towards the hither shore by invoking their gods. He told them that if they fail to do so then Bhagat Ravidas Ji would be asked to do this. Pandits were very happy for having been given the first choice. They recited many mantras for 24 hours but nothing happened. Then Bhagat Ravidas Ji was asked to get the idols floated towards hither side of the river. He started kirtan (singing of hymns) along with his bhajan mandli (hymns singing group). To the astonishment of all the idols crossed the river and came to the hither side of the river. At this several upper caste persons became his disciples. The Rajput princess Meeran Bai also became his disciple. No document handwritten by Bhagat Ravidas Ji is available. After he left for his heavenly abode, his followers noted down all that they remembered in the hymns sung by him. The first unpublished collection titled “Ravidas Ke Pad” (1589) was in the possession of Baba Haridas Ji of Aligarh. Under the same title another unpublished collection (1652) is present in the State Library of Jodhpur, Rajasthan. The third collection of his compositions titled “Ravidas Ji Ki Bani” is that published by Balvadra Press, Allahabad in 1908. Another important published collection is the Shastri and Pande’s book ‘Sant Ravidas Aur Un Ka Kavaya’ (1956). After this many other collections of his compositions have been published. It is thus clear that the earliest of his published compositions are the 40 hymns included by Sri Guru Arjan Dev Ji in Sri Guru Granth Sahib (1604), which were published 304 years before the publication Ravidas Ji ki Bani by the Balvadra Press, Allahabad. Without the Name of the Lord, all ostentatious displays are useless. Your Name is my prayer mat, and Your Name is the stone to grind the sandalwood. Your Name is the saffron which I take and sprinkle in offering to You. Your Name is the water, and Your Name is the sandalwood. The chanting of Your Name is the grinding of the sandalwood. I take it and offer all this to You. Your Name is the thread, and Your Name is the garland of flowers. The eighteen loads of vegetation are all too impure to offer to You. Why should I offer to You, that which You Yourself created? Your Name is the fan, which I wave over You. The whole world is engrossed in the eighteen Puraanas, the sixty-eight sacred shrines of pilgrimage, and the four sources of creation. Says Ravi Daas, Your Name is my Aartee, my lamp-lit worship-service. The True Name, Sat Naam, is the food which I offer to You. Says Ravi Daas, the Lord is nearer than our own hands and feet. What actions will bring emancipation, and total perfection? it is so long. since I have gazed upon the Blessed Vision of Your Darshan. O Lord of all worlds! reveal to me, even for an instant, the Blessed Vision of Your Darshan. This year i.e. in 2019, his 642nd Birth Anniversary is being celebrated on February 19 all over the world.